Unlike New York, Copenhagen, Denmark’s planners measure city streets for much more than "Vehicular Level of Service." 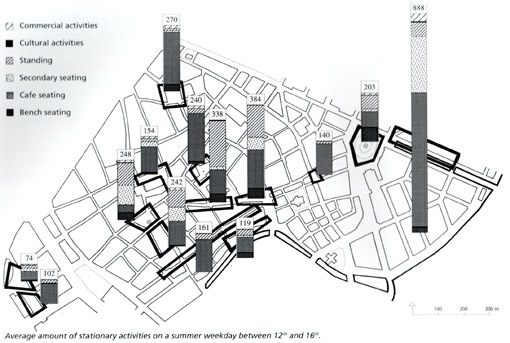 This map, for example, quantifies stationary activities on a summer weekday in the city center. From Public Spaces Public Life by Lars Gemzoe and Jan Gehl, 1996. As former Defense Secretary Donald Rumsfeld would say, Schaller Consulting’s new study, Traffic Information in NYC (PDF file), lays out the "known unknowns" of New York City traffic. It turns out that there is a lot that we don’t know. As Schaller points out, New York City traffic planning has "traditionally focused on ensuring an acceptable "Level of Service" (LOS) for motor vehicles passing through intersections, with the objective of maintaining acceptable levels of vehicular delay at each intersection." To calculate LOS, New York City’s Department of Transportation does "traffic counts." Counting cars and trucks is DOT’s main form of data collection. I had my first personal enounter with DOT’s LOS methodology in the summer of 2001. At the time, I was trying to figure out why drivers were so often getting jammed up at the intersection directly beneath my apartment. Actually, I was going somewhat berserk due to the never-ending chorus of horn-blasting outside my window. I became obsessed with identifying the problem and coming up with some solutions for it. I spent a lot of time observing how traffic worked on my street and came up with, what I thought, were some good, practical ideas for how signals could be re-timed to alleviate some of the of the problems. After weeks of effort, I finally managed to get a hold of the DOT staffer in charge of traffic signals. He was a nice guy and was generous with his time on the phone. He was familiar with my intersection and was impressed with the quality of my observations. But he disagreed with me on one major point. Whereas I saw — and heard — a profoundly dysfunctional intersection, he saw an intersection with an appropriate Vehicular Level of Service. The correct number of cars were moving through the intersection each day so there was no problem. Case closed. The City of London, England also does more than count cars and trucks to measure the performance of city streets. 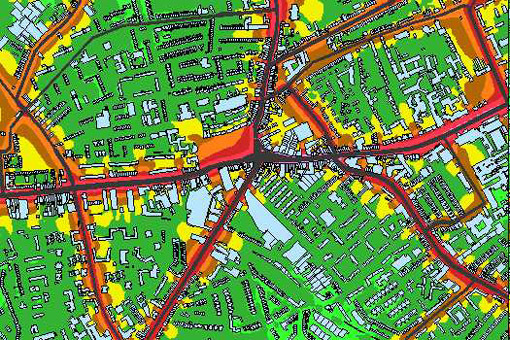 Check out the London Road Traffic Noise Map. DOT: "We’ll drive through and take a look at it." Me: "Will you get out of the car?" DOT: "That’s not what we do." So, how does the management of city streets impact residents’ quality of life? How does it impact pedestrian walkability, bus ridership, air quality or carbon emissions? Unfortunately, in New York City, these are all unknowns. Good management requires good data. But no one in city government collects the kind of data that would help us understand how our city streets are performing for anything other than the movement of motor vehicles. How many people are traveling by each mode on New York City streets — auto, bus, bike, foot? What is the relative attractiveness of different modes measured in terms of speed of travel, reliability of travel times, cost and comfort and convenience — the key factors affecting travelers choice of mode. How can the street system be used to more efficiently move people and goods? Which streets are moving people efficiently and which are not? (Note Schaller isn’t interested in the number of vehicles moving on city streets, but the number of people. A delayed bus carrying 40 people should be given more weight than a delayed SUV carrying one). In a speech last fall, DOT commissioner Iris Weinshall called for "challenging the old paradigms" and announced plans to "carefully consider a wide range of strategies to shift travel away from the automobile and onto transit." To fulfill that promise — to begin to manage New York City’s precious, limited public space better — Schaller’s new study puts forward the idea that city government needs to change the way it looks at city streets. 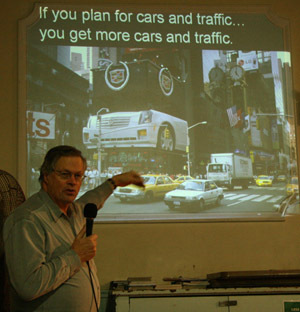 As President of Project for Public Spaces, Fred Kent often says, "If you plan for cars and traffic, you get cars and traffic. If you plan for people and places, you get people and places." I suppose Houston Street is another great example. Right now it is undergoing some massive retooling, some of which are downright unbelievable if you live in the area and are a pedestrain or bicyclist. But it often makes you wonder when DOT made their observations where they were or what time of day they made them. Did they even stand out there on a weekend? What that methodolgy was used? You can see clearly just how many pedestrians rely on the traffic island, and yet many of the islands are being cut in half to accomodate left hand turn lanes. Where will the people stand now? NOTE: This footage wasn’t even shot around any holiday shopping seasons. It is far worse then. The DOT traffic counts give equal weight to a car with one person in it as to a standing-room-only accordion bus? Are you freakin’ kidding me??? How is that anything remotely close to common sense, let alone best practices? Actually, this is so unbelievable that I seriously don’t believe it. Where is the evidence that the City DOT doesn’t give extra weighting to buses and at least SOME consideration — if only on occasion — to cyclist throughput and the quality of the pedestrian experience? > How is that anything remotely close to common sense, let alone best practices? It’s How Things Are Done. I was on the Transportation Advisory Board of my mid-size Colorado hometown. The city paid for LoS studies and constantly counted traffic. When I asked for data about cyclists, pedestrians and public transit users, however, that data is non-existant. I tried to get the city to count these other modes of transportation on Bike To Work Day — I even came up with ideas on how to fund these other traffic counts. There was plenty of “Hmm, that would be a good idea and we need to know this stuff,” but actual execution was like pulling teeth.